This week has gotten away from me a little. I haven’t had many home cooked meals and I’ve put my recipe testing on hold for a few days. I’ve been finishing up my holiday to do list — okay, I started and have almost finished up my holiday to do list. Luckily, I’m taking Friday off and plan to wrap things up, because on Saturday and Sunday I’ll be cooking for the family for Christmas. 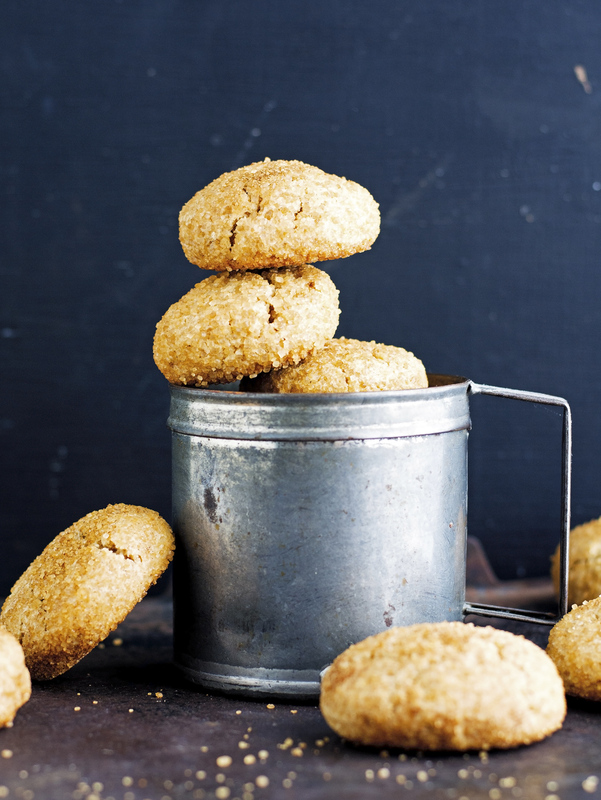 Snickerdoodles, why are they called snickerdoodles? No one knows where the name comes from. According to Wikipedia these cookies are probably German in origin, and the name is a corruption of the German word Schneckennudel. I’m not fond of the name, to tell you the truth. I almost wish they had another name. I do love the cookie though. Mouth watering and blasting with cinnamon flavor, hard on the outside and chewy on the inside, and once you bite into the crisp you can’t get the cinnamon out of your tongue. Awesome. Since it’s the holidays, I’m all about cookies. 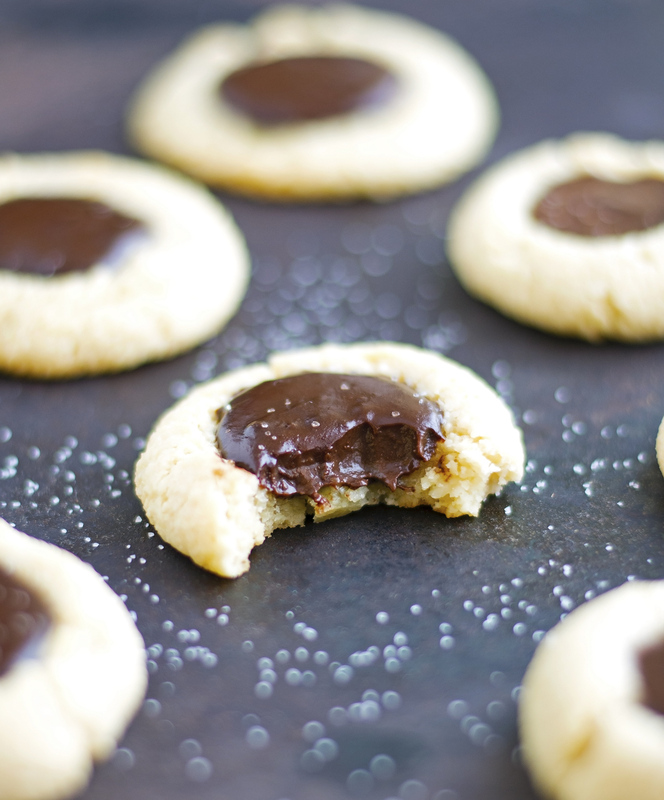 And today I’m going to share one of my very favorite cookie recipe: Almond Chocolate Thumbprint Cookies. Insanely delicious, super easy to make, and great for holiday parties and cookie exchanges (if you’re into that). And you know what? 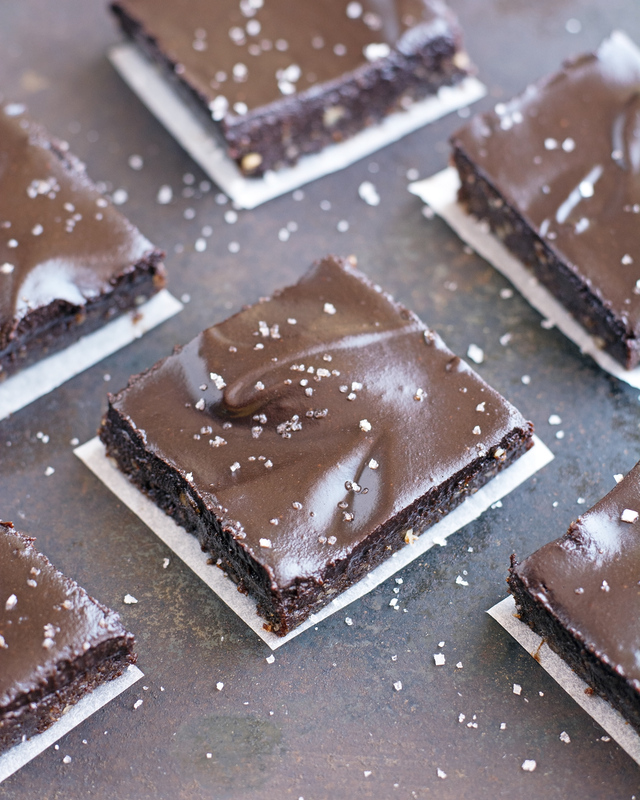 They are also gluten-free and can be made vegan and/or paleo if you want. 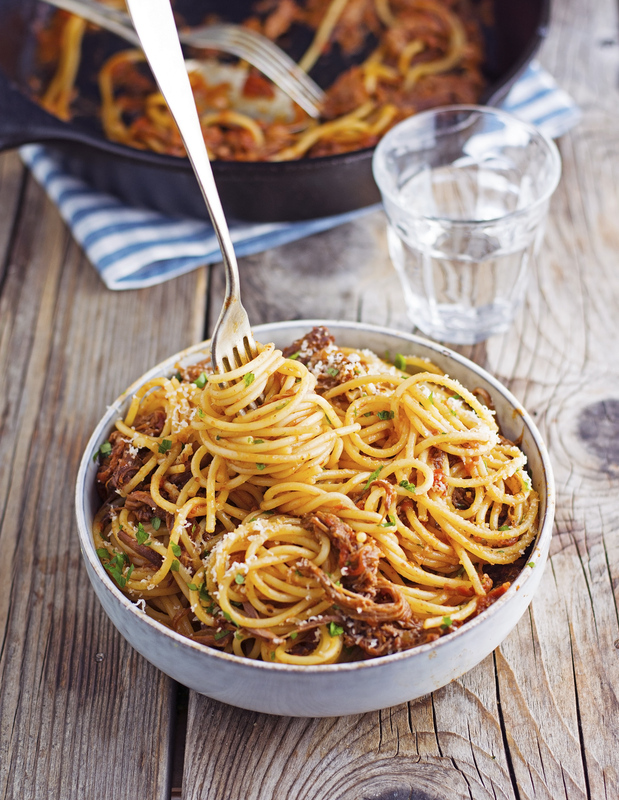 Ragu is one of those recipes that really showcases the beauty of Italian cooking: everyday ingredients, fast prep, long and slow cooking until you get a luscious dish that tastes like a million bucks. 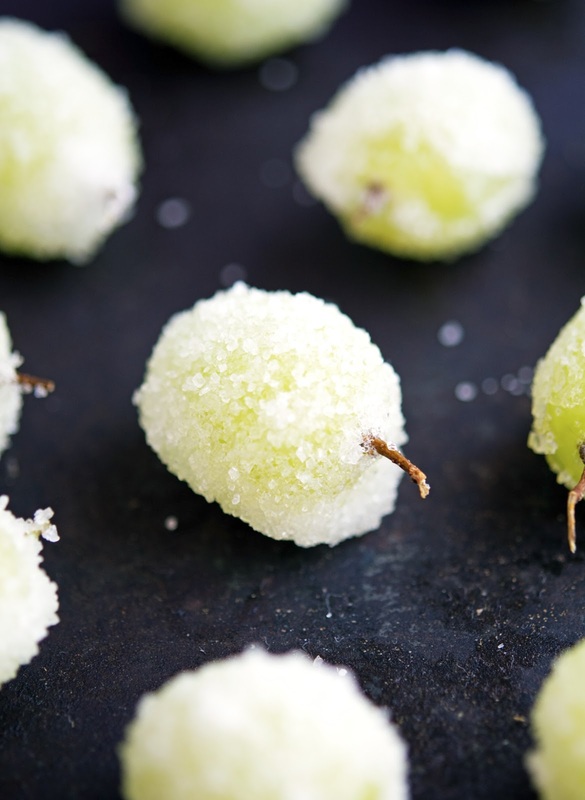 Seriously, is there anything more festive than these sugared grapes? 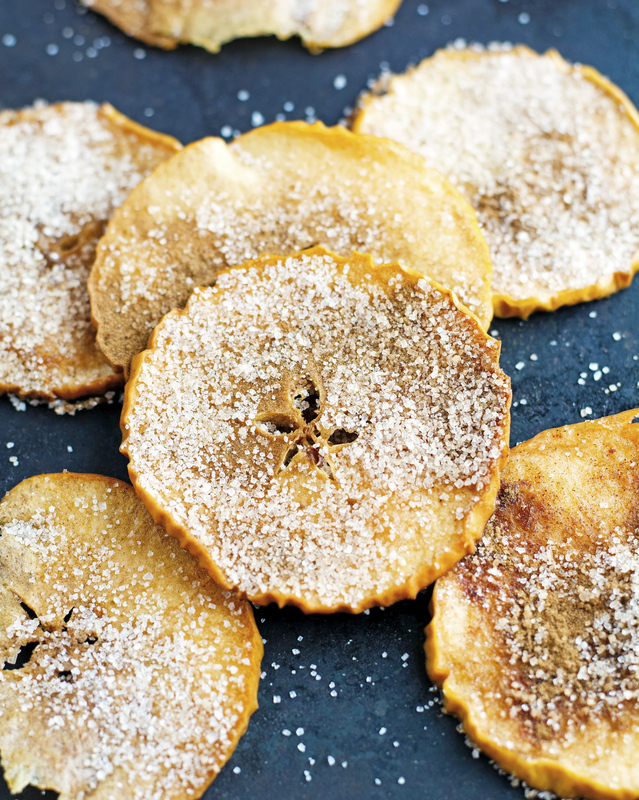 Not only they are a yummy snack but you can use them as a decoration to your holiday desserts. Imagine a classic white layer cake topped with these grapes. It's pretty awesome if you ask me. No matter how inventive or creative or ingenious I try to be be with my weekday lunches, at some point I end up craving just a simple tuna salad sandwich. 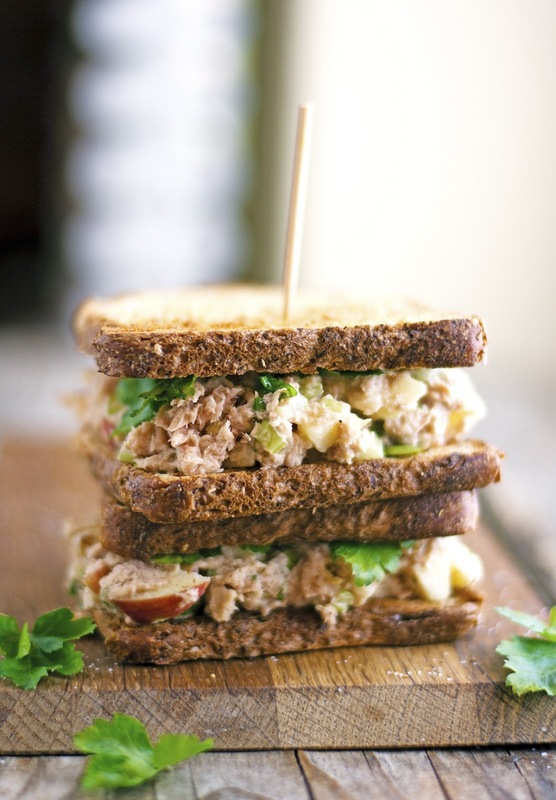 Just like egg salad, a tuna salad may be the ultimate lunchtime comfort food. Perfect for cold sandwiches or fresh wraps on the go. Here’s my favorite, not-so-basic tuna salad recipe. I think it’s just about perfect. 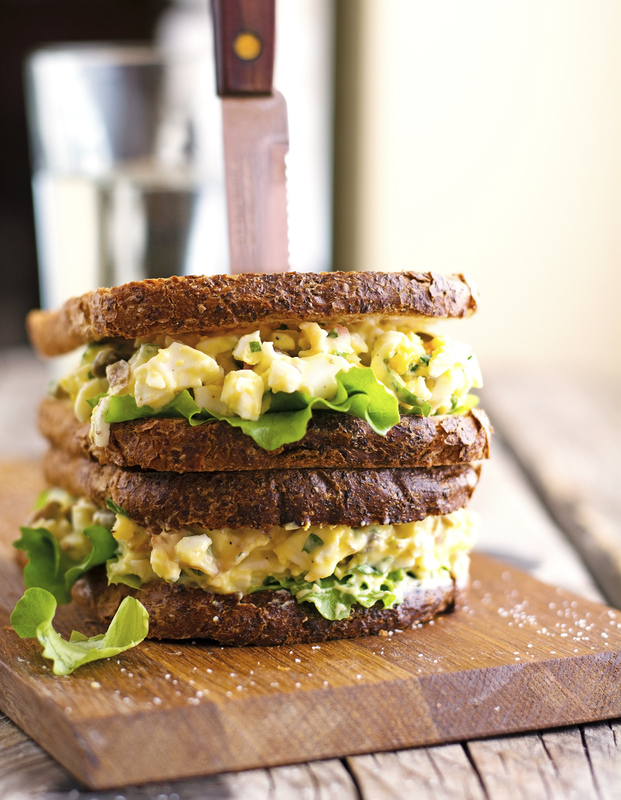 I’m going to make a confession guys, this egg salad is (as the title suggests) fancy and high-maintenance. Made from a few ordinary ingredients it's more than the sum of its parts: well balanced, with bright fresh flavors, and a texture that spans from rich and creamy to crunchy. I am certain that for many of you — just like myself — the sole preoccupation right now is Thanksgiving menu and that you probably forget — just like myself — that in order to survive and make it to Thursday alive you still need to eat. 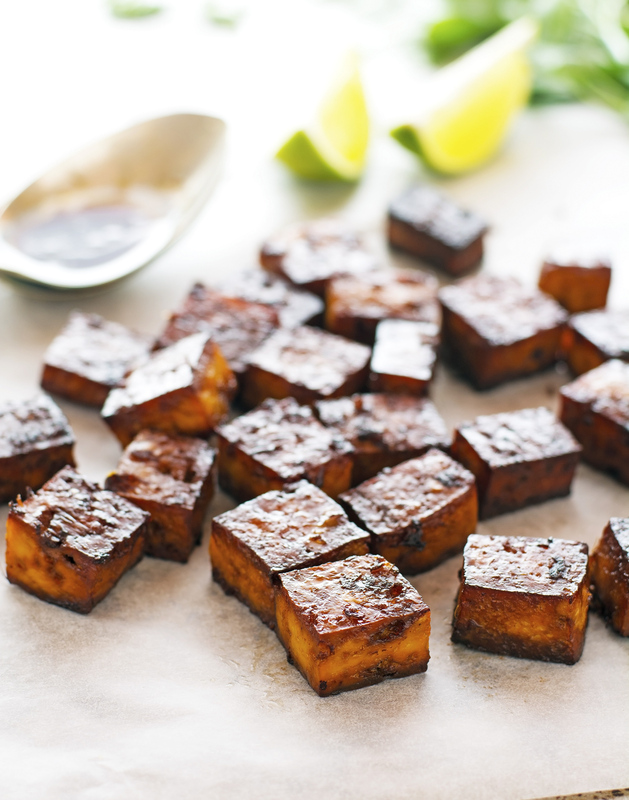 (D) last but not least, is super delicious and wholesome, while being healthy and nutritious. I love lasagna, I know I’m not the only one: Creamy, rich, comforting, it’s hard not to love it. Pasta noodles baked with bolognese sauce, mozzarella, and Parmesan cheese into something delectable and truly irresistible. I would go as far as saying that it’s an epic dish. Oh sure, it looks like an ordinary broiled mass, but it’s so much more. However, lasagna isn’t a dish for the calorie conscious — it’s incredibly, let me say that again i-n-c-r-e-d-i-b-l-y rich. I was not, in fact, looking for a new rice dish. I have already so many, I certainly do not need one more. But, as it happens, because I’m terrible at timely meal-planning, I was attempting to make this chicken for dinner a couple of weeks ago and it wasn’t ready on time, or even close to it. That’s when I remembered a one-pan Spanish rice I made in February that was both delicious and easy to make. Realizing I had almost all the ingredients on hand, I rustled it up. But since I had Nephew and Niece over for lunch, I made a few tweaks (no spices, marinara sauce instead of tomato sauce, etc.) and what began as Spanish flavored rice ended up looking much more as a tomato rice that smelled like pizza. So I took it a step further, sprinkled some mozzarella I had in the fridge, dotted with mini-pepperoni slices, five minutes under the broiler and BOOM a delicious One Pot Pizza Rice. The kids loved it so much they asked for seconds, and thirds. Actually, they polished it ALL off. 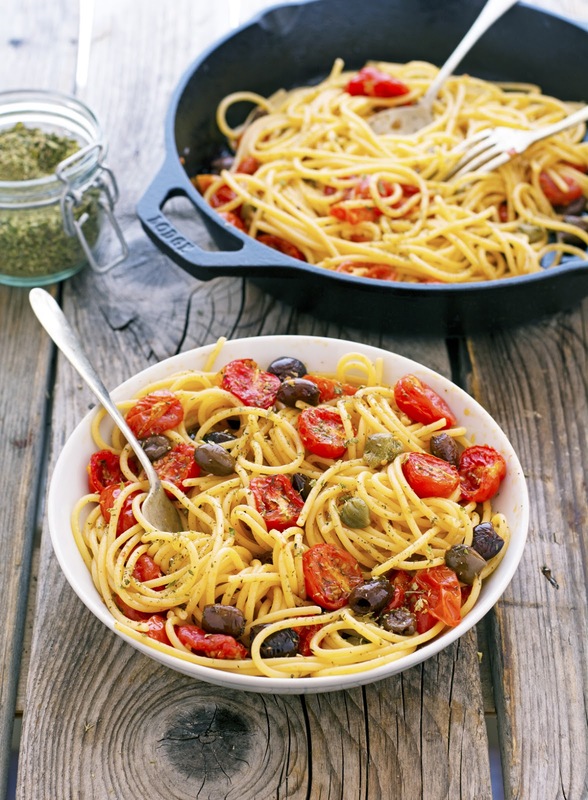 Weeknight dinners don’t get simpler or healthier than this. 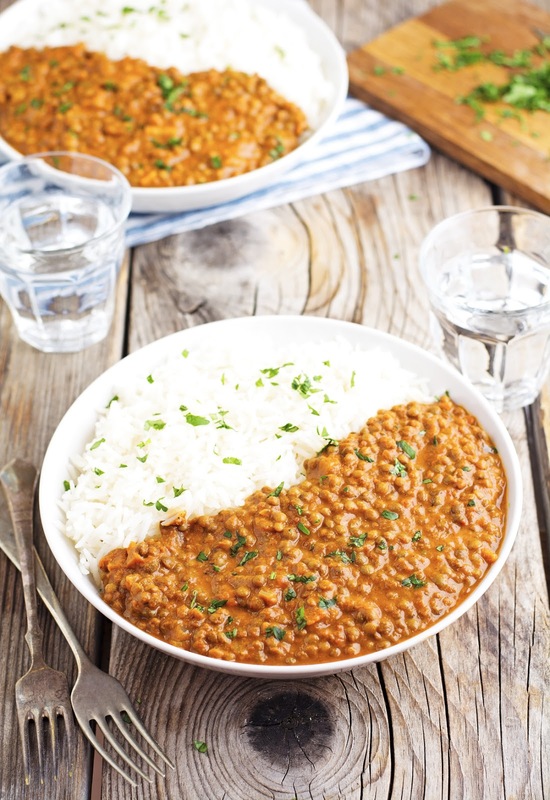 You can prep everything for these (Vegan) Creamy Crock Pot Coconut Curry Lentils in 5 minutes tops, then toss it all in your slow cooker and with no other effort required on your part, you’ll have a healthy meal that everyone will love. Fact is, when I’m using the crock pot to save time (and stay out of the kitchen) I like to keep things as simple as possible, and believe me when I say that it doesn’t get simpler than this. Just some peeling and chopping is needed, then throw everything in the slow cooker, go out to work or run errands, and when you get home you don’t have to start fussing with dinner—the work’s already done. I love applesauce. I know that makes me sound like I’m three years old, but I will freely admit it with no shame whatsoever. However, I am also very picky about my applesauce — this also makes me sound like I’m three years old. I do not like overly sweet applesauce, and I abhor those applesauce flavors you can buy at the store, like tropical or mixed berry. The only fruit sauce combination I accept is apple+apple+apple. And needless to say, it I prefer homemade applesauce to store-bought. Straight-up apples that have been cooked down into a thick pulp, with lemon juice and a bit of cinnamon. So simple, so incredibly delicious. It’s well known that I’m a harissa fiend. I have a love affair with the North African fiery paste and I love putting it on…well, everything. Spaghetti, chicken, potato salad, you name it. So it was only a matter of time before I would put it inside a burger to create a — in my humble opinion — memorable meal. I am embarrassed by how long it took me to post a recipe for carnitas — or “little meats” that are usually braised then roasted — which are as far as I’m concerned the very best thing to pile on a corn tortilla. To me, they’re the undisputed king of the taco food truck. 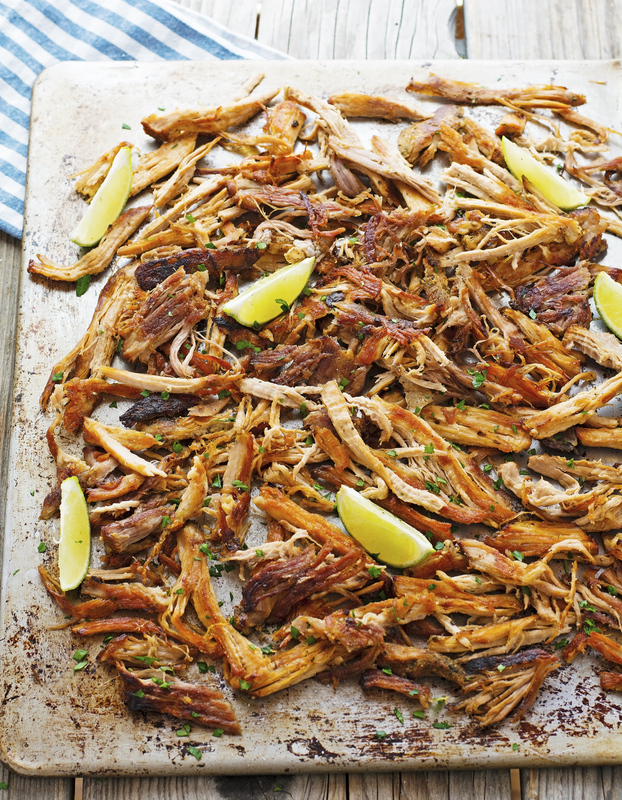 The Mexican answer to American pulled pork: moist, juicy with a rich and tender texture, and riddled with plenty of well-browned crisp edges. The only thing greater than my love for carnitas was my wonderment as to how they were made. I imagined that getting a flavor so complex, and a texture so nuanced — tender in the center and crunchy at the edges — was best left to the experts. That’s why I continued for many happy years to pay a premium price for them, especially in a city where good food can cost the earth. This recipe is proof that vegetable side dishes don’t have to be boring. Or, to put it in other words, that there are tasty ways to prepare what could be a boring vegetable for a side dish. Because let’s face it, sometimes carrots can be pretty mundane just plain on the side of your main dish. 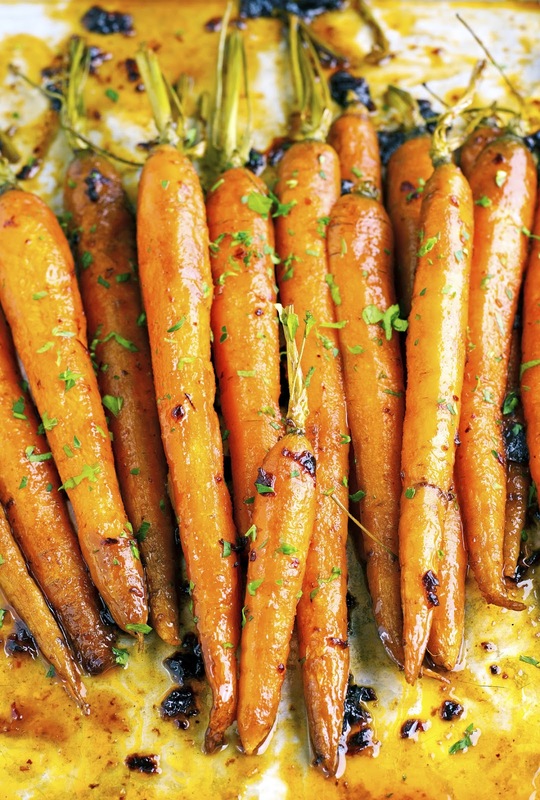 Introducing Maple Chipotle Roasted Carrots. 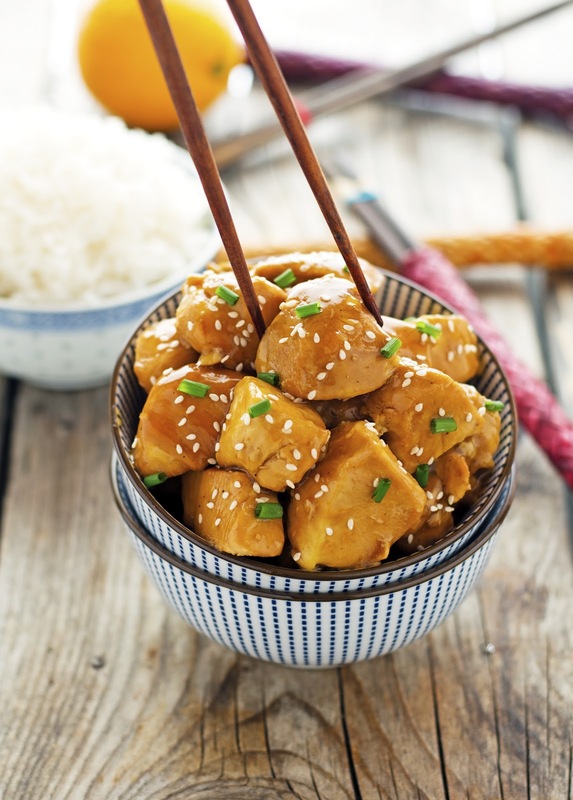 Let’s get things straight people: if you’re looking for something that is going to be a Panda Express style orange chicken, this recipe ain’t for you. There’s no breading and deep frying, that’s not how slow cooking works. There’s not a chance in the world that you will get crispy orange chicken out of it. Actually, you won’t get crispy anything out of a Crock Pot. However, if you’re craving orange-y, savory, sweet and sour, spicy melt-in-your-mouth chicken, then look no further because I have the perfect recipe for you. First of all, I need to say a big capitalized WOW! 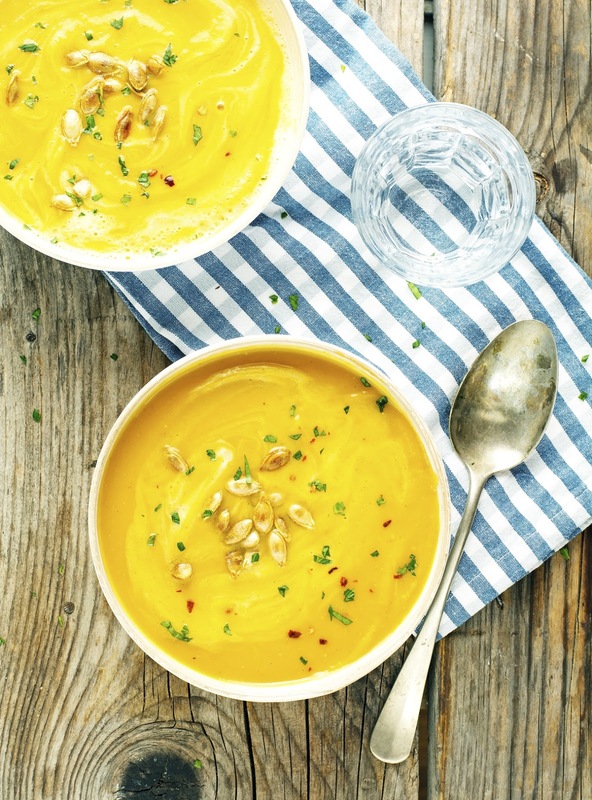 I know this sounds a tad arrogant, but WOW is the only word that comes to mind to describe this (Vegan) Creamy Curried Butternut Squash Soup. A rich, savory, and delicious soup that is also healthy, low calorie, and super easy to make. And you know what? It tastes like it was simmered long and low in order to develop such depth, but in reality it takes about 30 minutes to make, from start to finish. 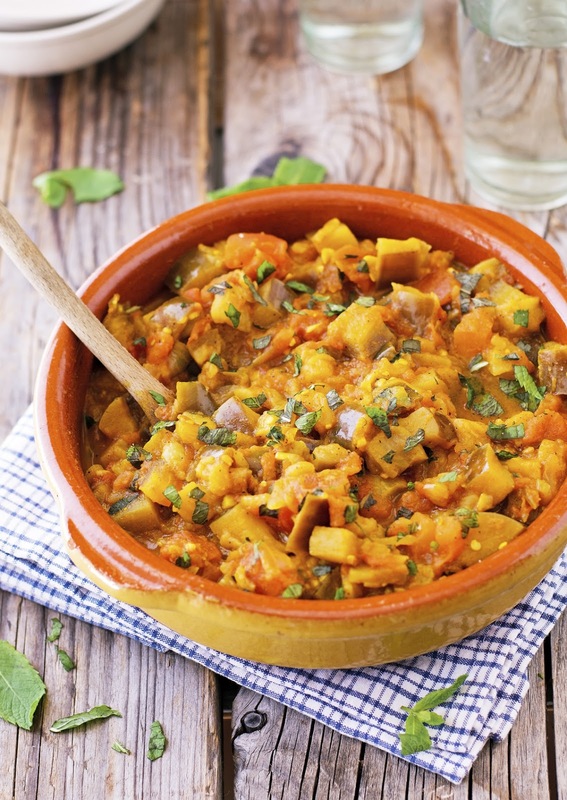 There are layers of flavor that will first tease your palate with butternut squash delicious savory notes. Next, you discover the wonderful sweet undertone of coconut milk, making it even more interesting. Lastly, you feel the curry with its unique blend of savory and sweet spices, but not overwhelmingly so. All in all, perfectly a balanced and wonderful soup. 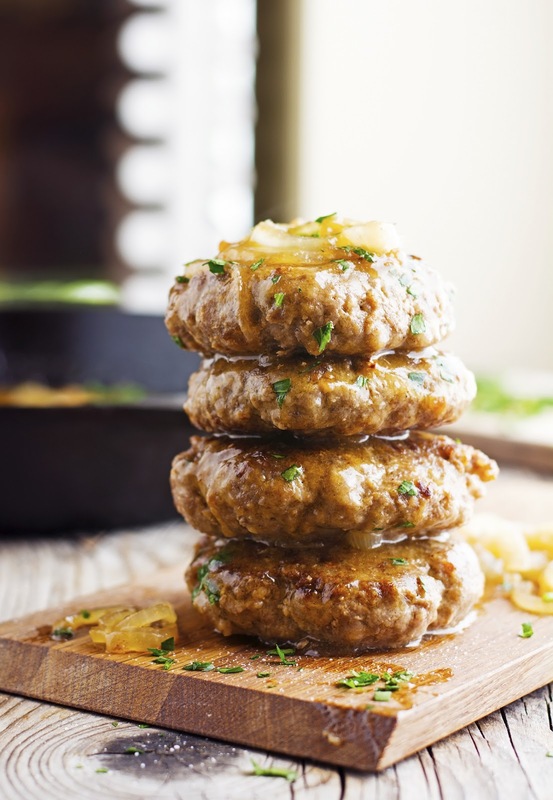 There are some dishes that are the epitome of comfort food: hamburger steak with onions and gravy is one of those. I grew up eating this meal alongside mashed potatoes, sweet peas, and dinner rolls. Still today, the smell of onions and gravy reminds me of the good old days when life was easy, wonderful, and almost nothing mattered. 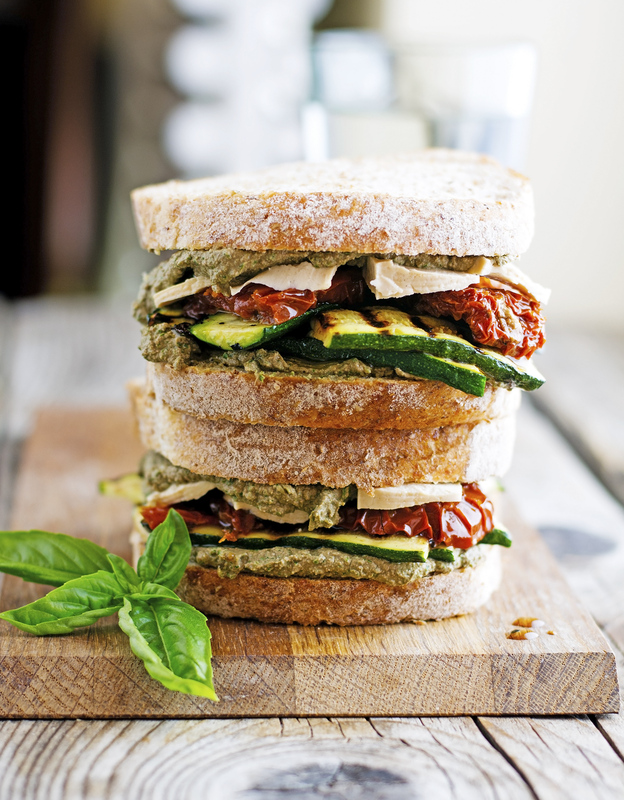 Today I am sharing this stacked lunchtime sandwich that I made myself last week. I had not made a big lunch sandwich in a while and this one really hit the spot. I don’t think I’ve ever made a better sandwich than this, vegan or not. And though I’m reluctant to post sandwich recipes on the blog because I believe they are slap together meals, this...this I had to share. 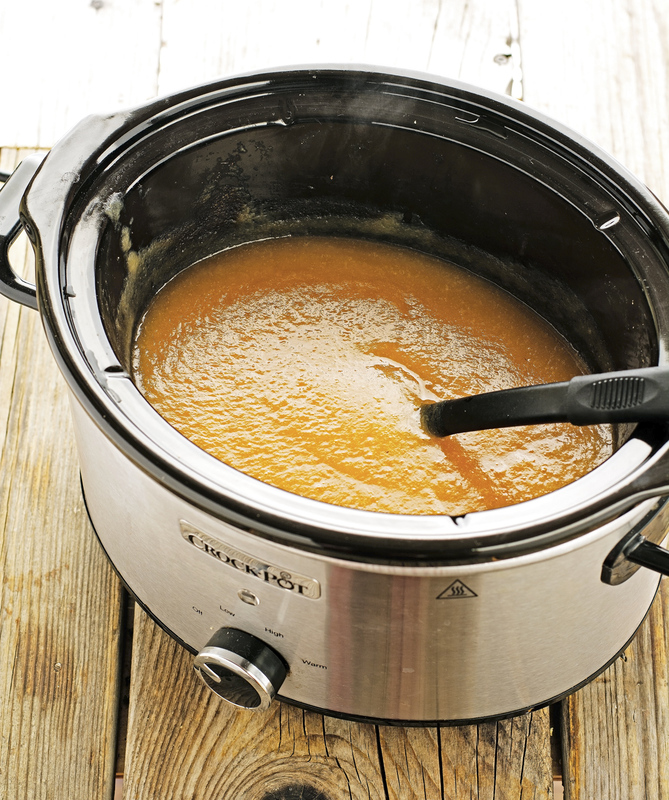 Ease, comfort, and little prep — these are a few reasons why you should love your Crock Pot, especially after a long day at work. 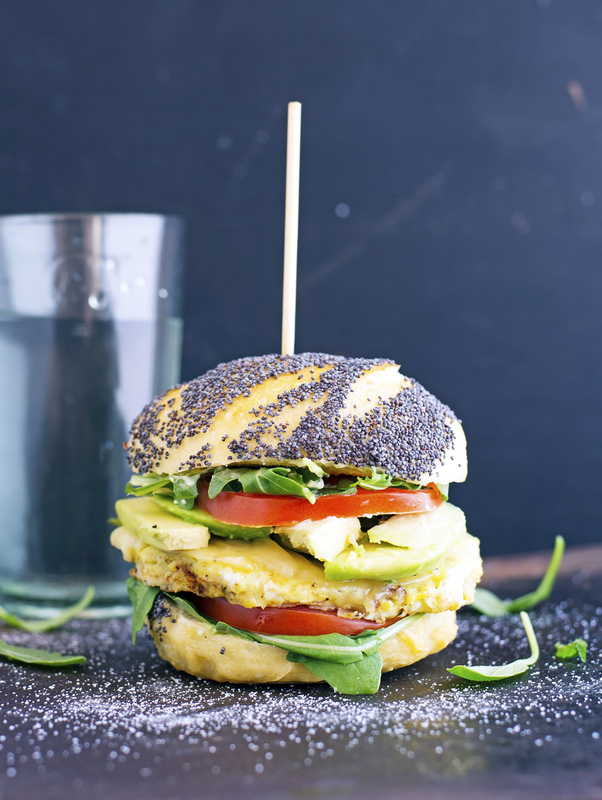 You know those evenings when you come home super tired, you’re feeling lazy and not in the mood to cook but still want something delicious and healthy to eat? It’s in those times that you’ll be thankful for your slow cooker and that you’ve already planned for that meal you’re about to eat. I have a secret to tell you guys, one of my fave healthy treats to snack on are apple chips. Crunchy, crispy, and totally addicting. I started making them at home a couple of weeks ago, and I haven’t stopped ever since. They are so easy and cheap to make. Slice the apple, sprinkle with cinnamon-sugar, bake in the oven and voilà: cinnamon sugar apple chips. No-brainer. I can say without fear of contradictions that these apple chips are the perfect year-round healthy snack. But since the beginning of fall is apple season (when prices are lowest), this is the perfect time to give this recipe a go. And you know what’s even better? That they fill your house with the aroma of baked apple pie, without the guilt. Cool, right? 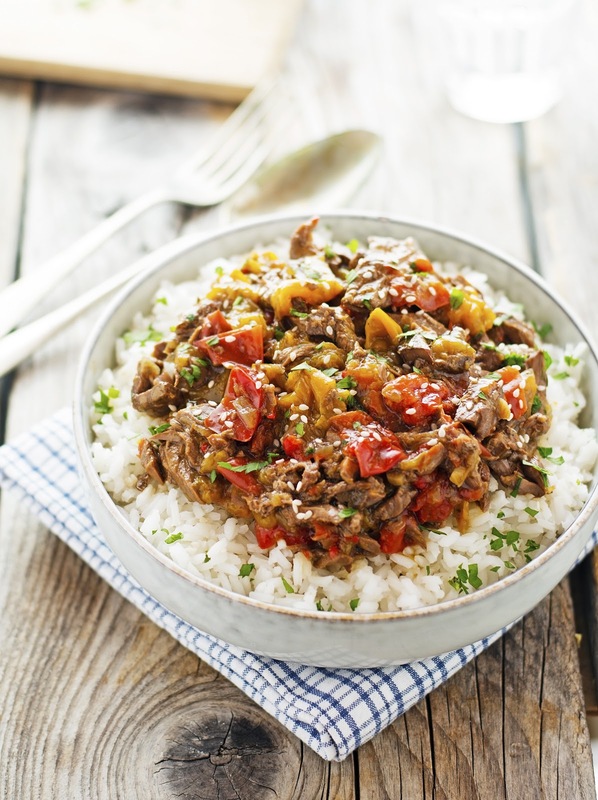 Pepper steak is a Chinese American dish in which strips of beef and bell peppers are stir fried in a wok and seasoned with soy sauce and ginger to create a delicious umami-packed meal. 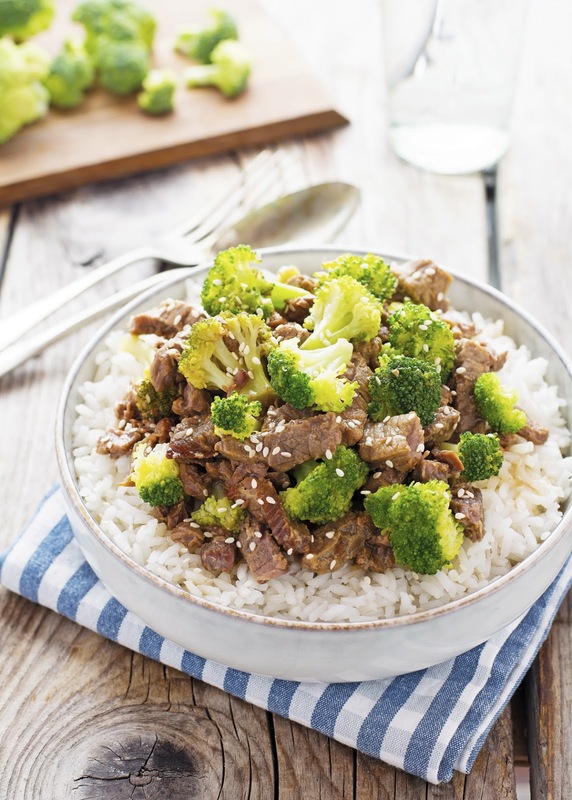 Even though it’s actually a stir fry recipe, it’s easily adaptable to the Crock Pot. And while the slow cooker method is definitely not “authentic”, it certainly tastes awesome, and requires almost zero prep time. I took a short (okay, maybe the longish kind of short) break from my TIY posting schedule to travel and relax. I needed it. But now I’m back and ready to feed your appetites, starting now. Are you ready? Today’s recipe is to some extent similar to eggplant parmesan, but it’s assembled in single-portion little stacks. Much much much much simpler to make. 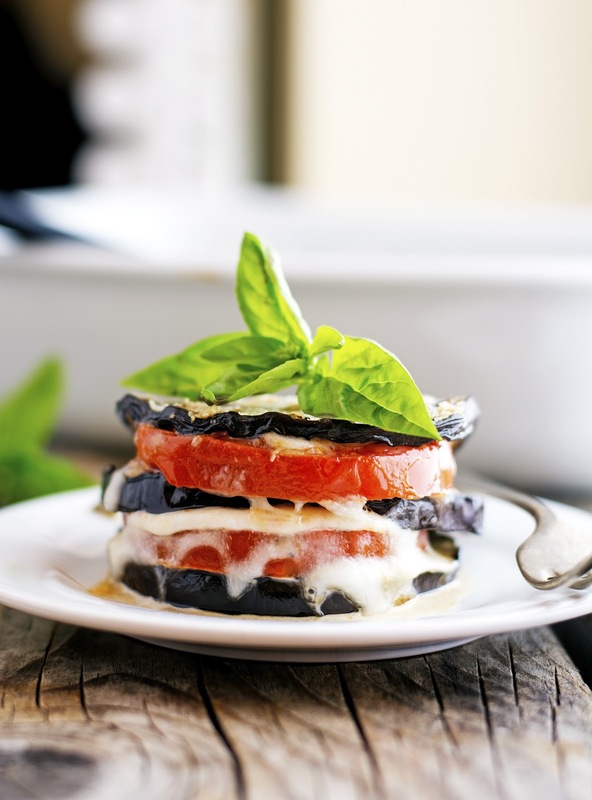 Layers of tender grilled eggplant, slices of charred tomato, melty mozzarella, sharp Parmesan cheese, fresh basil leaves...could it get any better? If you’ve ever been to Maryland, you know eating crabs is a summer pastime: picnic tables covered with brown paper, silver buckets, buttered corn, french fries, cornbread, and the unmistakable scent of seafood. In Maryland crab meat goes on everything: hamburgers, stuffed shrimps, stuffed mushrooms, soup, literally everything gets crab meat. 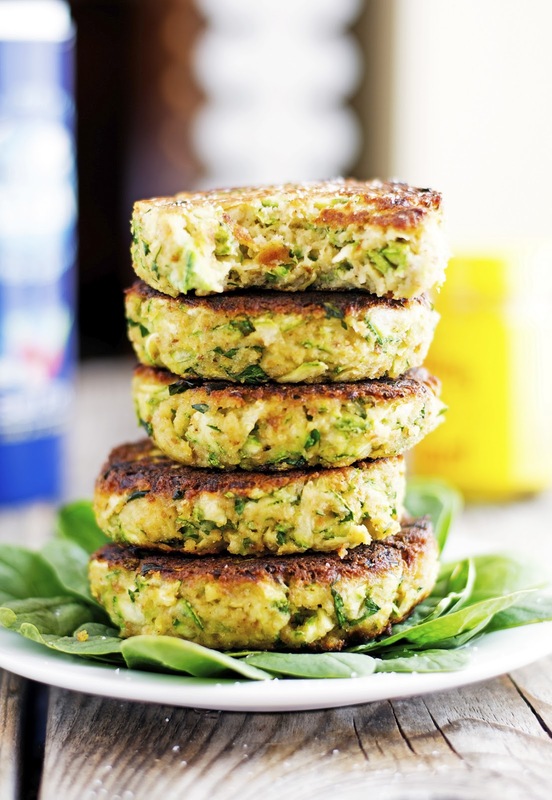 But my absolute favorite thing made with crab meat are crab cakes. When done right, crab cakes are just fabulous: the perfect blend of lump crabmeat, hardly any filler, and an amazing blend of seasoning. DELISH! First off, let’s make things clear: Blackened chicken is NOT the result of burning your chicken, or cooking it too long, or from it sticking to the pan. 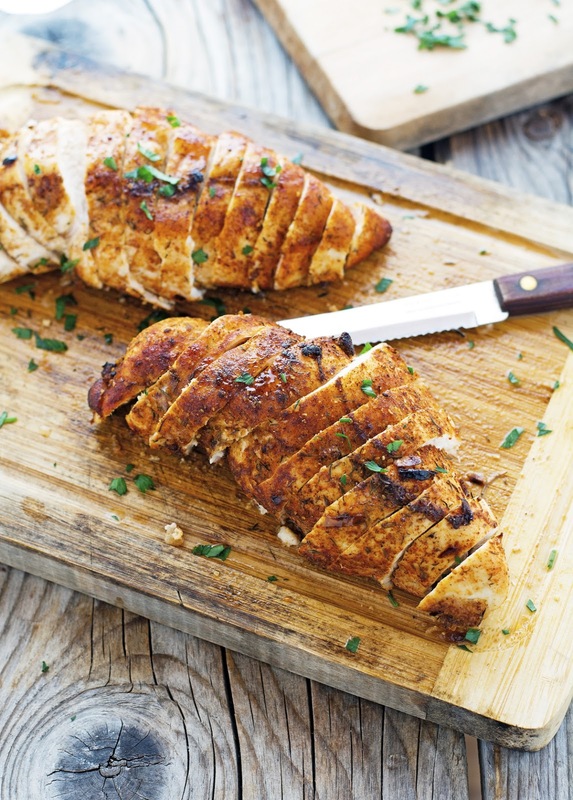 No, the blackened part of the chicken is the result of a mix of spices and herbs (paprika, salt, cayenne pepper, cumin, thyme, white pepper and onion powder) that coats the chicken and when put to high heat, gives the chicken an outer char. Usually the coated chicken is seared on a smoking hot skillet to create the blackened effect and then it finishes cooking in the oven. But in an effort to simplify the cooking process, I skip the ‘smoking hot skillet’ part and instead cook the chicken under the broiler. It gets a little less blackened but the taste and texture are there, believe me. 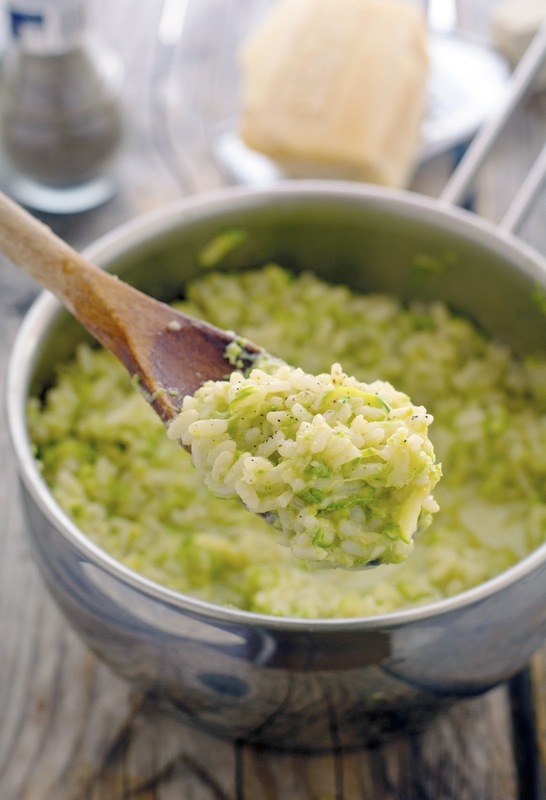 After I posted the recipe for the One-Pot Creamy Garlic Zucchini Rice three weeks ago, Mark @JerseyStylePhotography asked me if I have ever tried making it with beets instead of zukes. Since I’m not very fond of beets — despite a recipe for chocolate beet cake and one for beet juice on this blog — my answer was of course “No”. 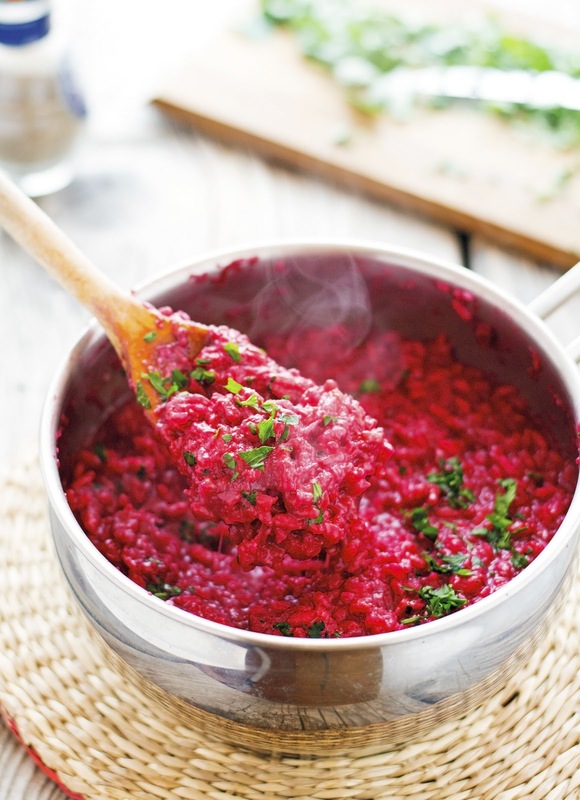 I mean, why on earth would someone ruin a perfectly good recipe with beets? What is your all time favorite sandwich? The one you think is the ultimate sammie? For me it’s the BLT. 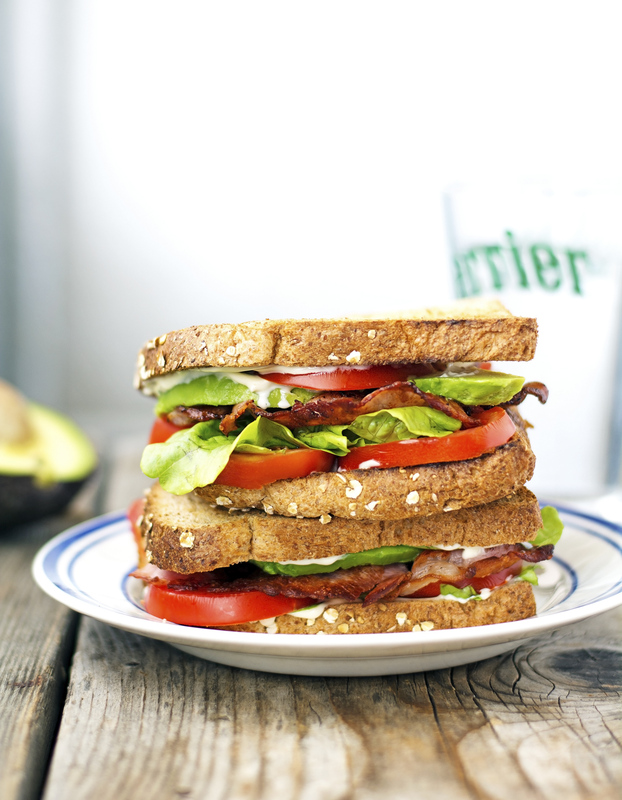 Sorry, let me rephrase that, it's the avocado BLT. It’s my feel-good sandwich and my guilty pleasure, especially after a very hectic work deadline or a grueling workout. Bacon, lettuce, tomato, and avocado on toasted bread with a bit of mayo. So simple, so very delicious. This awesome Maple Peach Blueberry Crumble lived a full life of about 10 minutes before being devoured by me, sister, nephew, and niece, while sipping Blackberry Mint Iced Tea. A perfect pairing if you ask me. And you know what? Two kids unknowingly devouring a homemade gluten-free fruit crumble and loving it is mysteriously satisfying. I honestly wasn’t trying to trick anyone but I found myself giggling from the kitchen and intentionally withholding the knowledge that this was healthish. I am fairly certain that I wait all year for tomato season, you know, the same way I wait for the Giants to get back to the field or for Apple to release its latest gadget. I don’t know why I get so excited about tomatoes. It’s in my DNA, and I’ve learned to accept it. I eat them on eggs, in frittatas, cooked and raw in every possible format and seriously, don’t even try to bring me a sandwich without a thin slice of tomato in it. Sister did it once and let’s just say, it didn’t go very well. Okay people, this is barely a recipe. 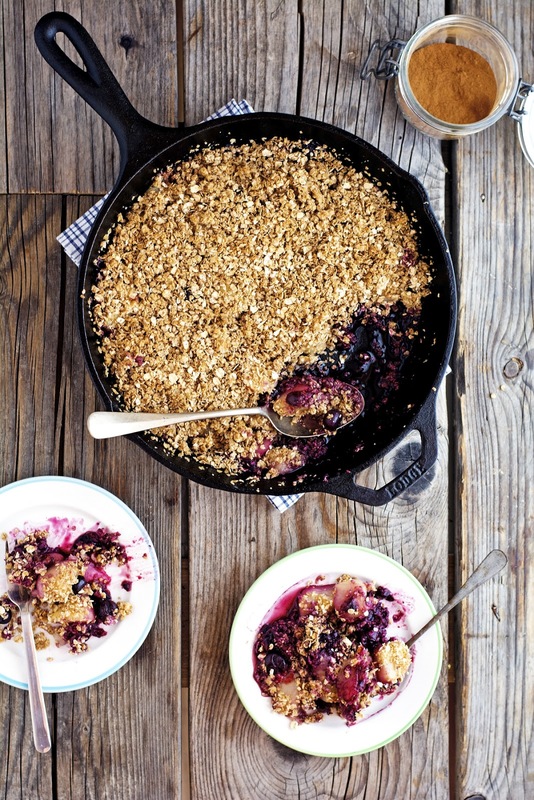 It’s more a suggestion of how to best celebrate the incredibly sweet plums. Since I was a kid I loved plums. Red plums, black plums, yellow plums, and even green plums. 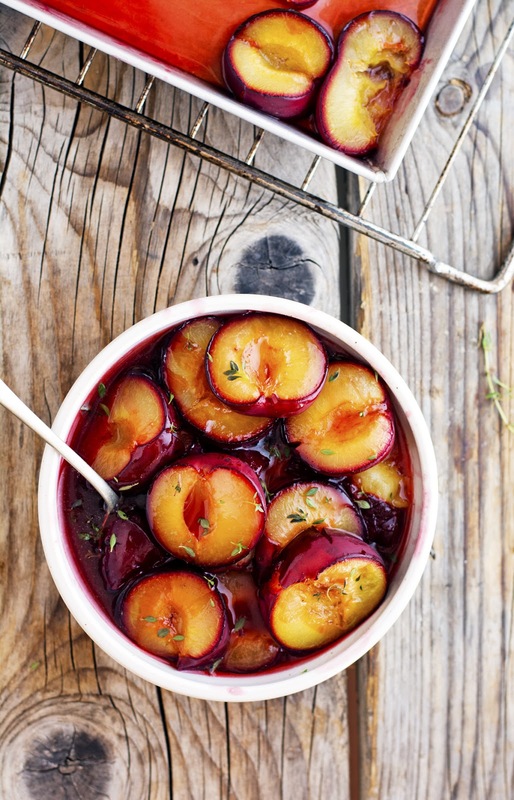 When ripe, plums are wonderfully sweet with a rich, complex flavor. They are a convincing argument that fruit is the best candy there is. So sweet, so juicy, so tender. At this point you are well aware that I love making my own iced teas and adding different combinations of fruit and fresh herbs. So far I’ve made Rosemary-Peach, Raspberry Mint, Ginger Mint, and even a Lemon Sparkling Iced Tea. And today I present you with some awesome, super refreshing Blackberry Mint Iced Green Tea. Because the heat wave we’re currently experiencing in my neck of the woods is a double-whammy (with high heat and high humidity) and one of the most effective ways to cool off is to sit in the cool shade and drink a tall glass of iced tea. Or at least that’s what I like to do! So far, the summer has been cruel: Hot, humid, and sticky just about every single day, and more often than not a combination of all three. So you should take me seriously when I say that the heat is getting to me and that I have zero desire to cook anything that involves turning on the oven for more than 5 minutes. Besides, why would you even need to cook for longer than 5 minutes in the dead heat of the summer? The farmers’ markets are overflowing with produce that require minimal (or zero) heat to make it tasty: Tomatoes, zucchini, and glorious stone fruit. People, the season of zucchini overabundance is officially here. The other day I came home from the farmers market with so much zucchini the overflow from the refrigerator filled a big bowl on my counter. Don’t get me wrong, I wasn’t scared at all. For many the summer mantra is “too much zucchini”, but my attitude is: Bring ‘em on. I love zucchini so very much. It’s one of the most wondrous ingredients available and a gift to the seasonal cook. 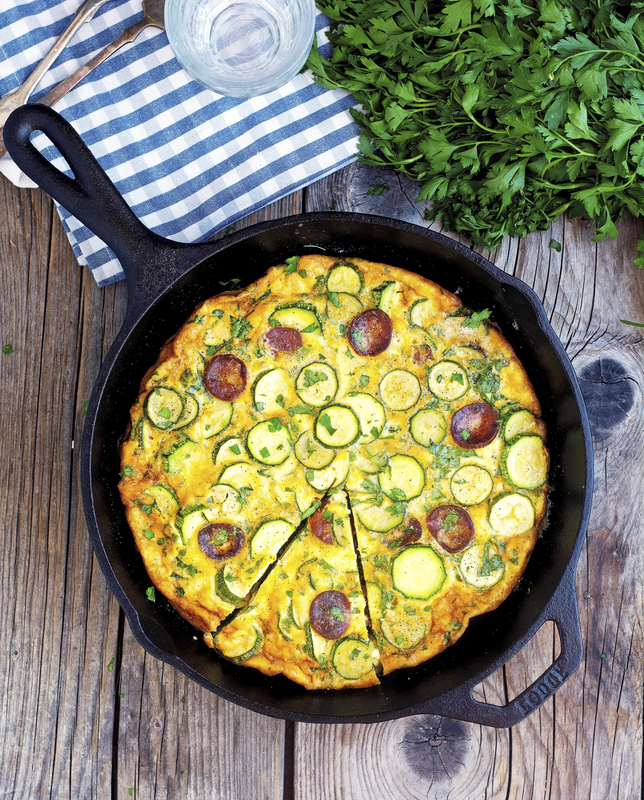 Zoodles, casseroles, patties, fritters, frittata, even a grilled cheese. 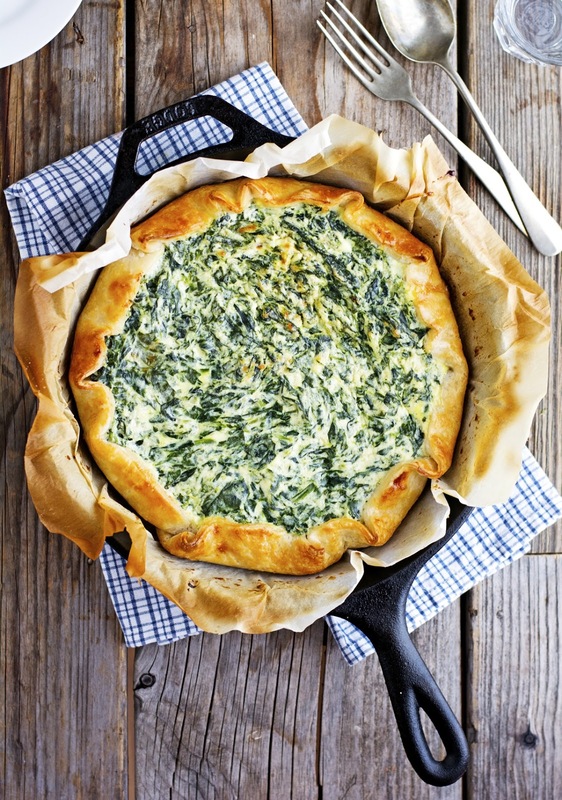 You can do anything with zucchini! As far as I’m concerned, I have a really clear idea of what a chicken salad should taste: crunchy, salty and sweet, juicy and tangy, fresh and light, flavorful and satisfying. 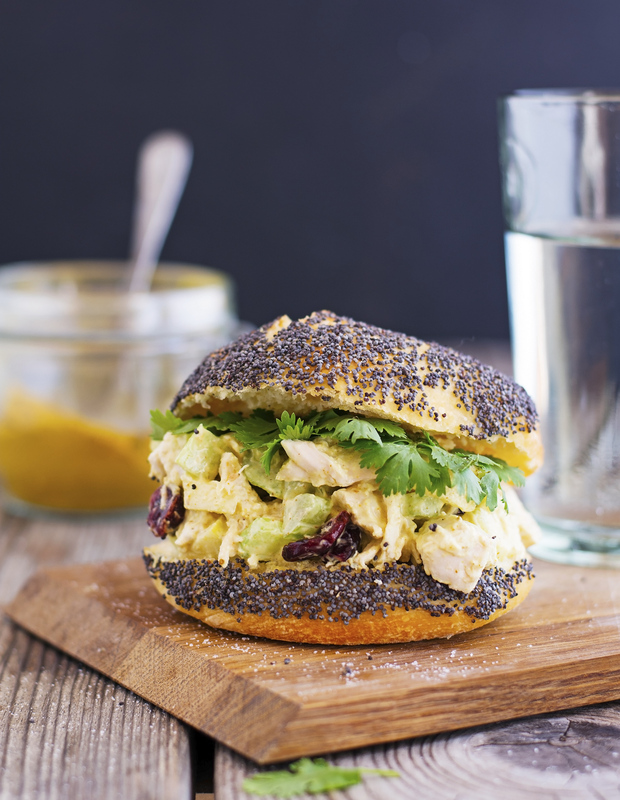 Believe it or not, this Curried Light Chicken Salad is all the above and maybe even more. Which is the reason why I’ve been making big batches of this and snack on it throughout the week and pack it up for lunch. I love this recipe for so many reasons. 1) So simple. Throw everything in the blender, pour it in a baking pan, and bake. It seriously doesn't get any simpler than this. 2) Flourless. There's no flour or flour substitute. No almond flour. No coconut flour. None of that. In fact, there's no “specialty” ingredients at all. 3) Only 6 ingredients. I can’t believe I haven’t started with this one. How good is that, though? Only 6 ingredients! 4) The flavor. Oh, how do I describe it? Before baking, the mixture is like a delicious thick banana chocolate smoothie. And though one is tempted to drink it all, I recommend you bake it. 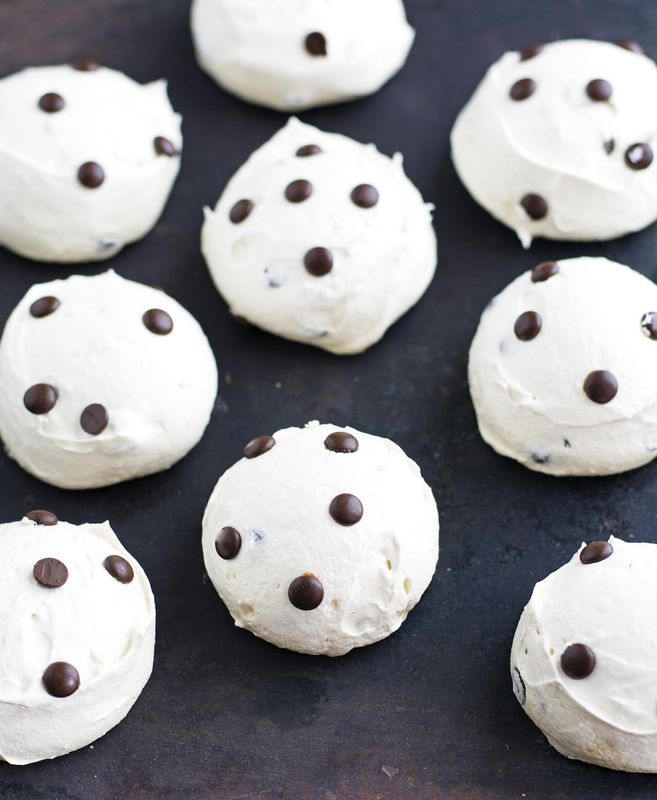 Because after baking it becomes uh-mazing. 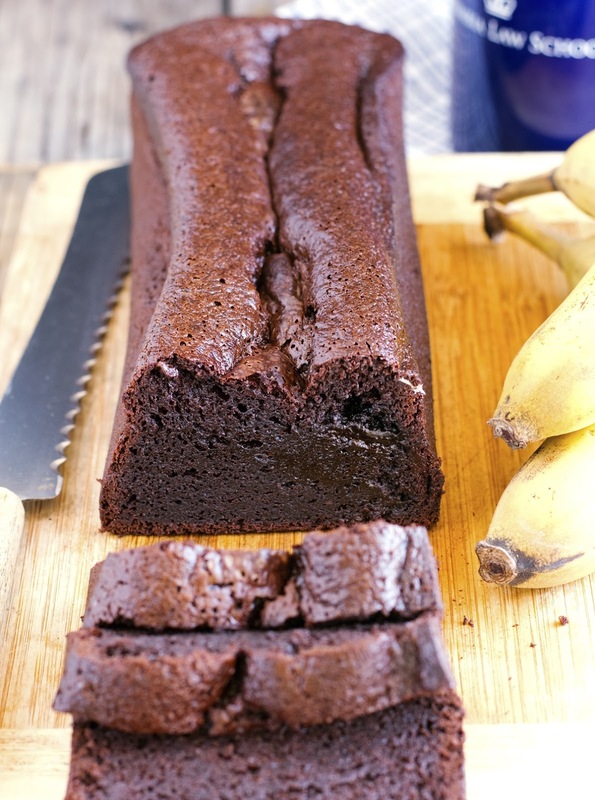 A fudgy, thick, moist, delectable banana bread that tastes almost like a brownie. As you are probably already aware, quinoa is one of my favorite ingredients to work because not only it has a great nutritional profile, it also is incredibly versatile. 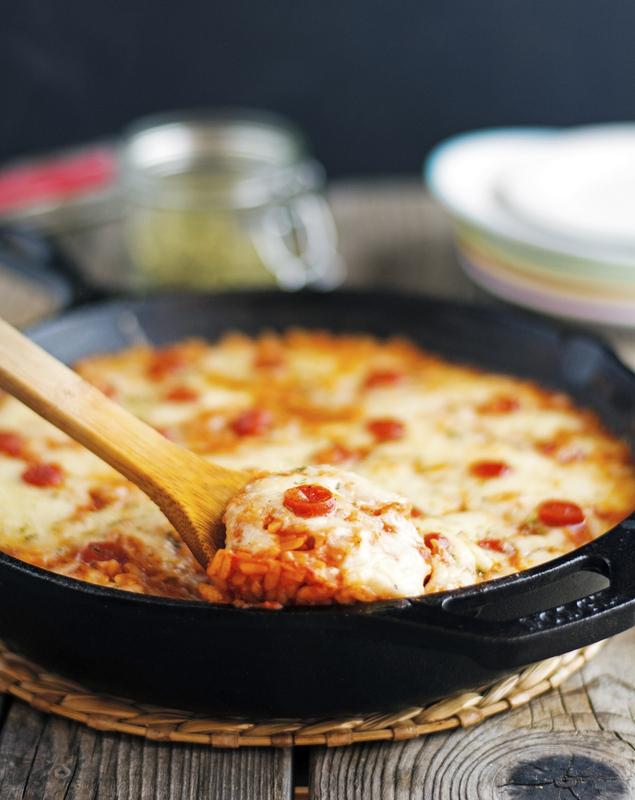 You can use quinoa in a wide variety of dishes: casseroles, meatballs, salads, pizza crust or soups. Quinoa is a superfood for many reasons. It’s gluten-free, easy to digest, packed with fiber, essential vitamins, and it’s also a complete protein (meaning that it contains all of the essential amino-acids). 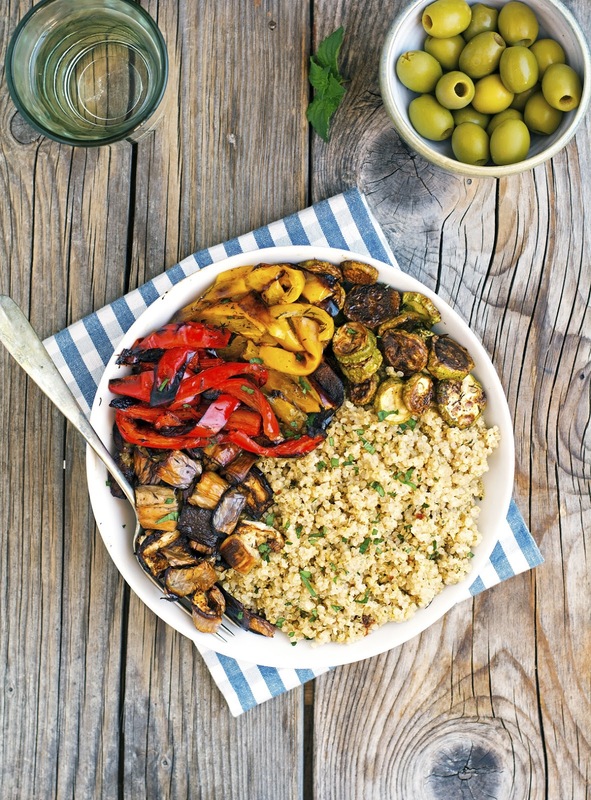 Meaning that quinoa is a perfect option for anyone following a plant-based diet. Also for anyone that is trying to move from a meat centered diet, but is concerned about their protein intake. For reasons I can’t fully understand, if you show up at a 4th of July barbecue with pitchers of freshly-squeezed lemonade, you’ll be greeted and revered; but if you show up with the same pitchers of freshly-made green tea lemonade, people will actually flip out. Why is green tea lemonade far more exciting than regular lemonade? It is a mystery to me as well. But that’s what happened the day before yesterday at a friend’s Fourth of July party. Along with other food items I was asked to bring lemonade. I thought about bringing Cherry Lemonade, Peach Mint Lemonade, Blueberry Lemonade or just regular yellow pale lemonade. 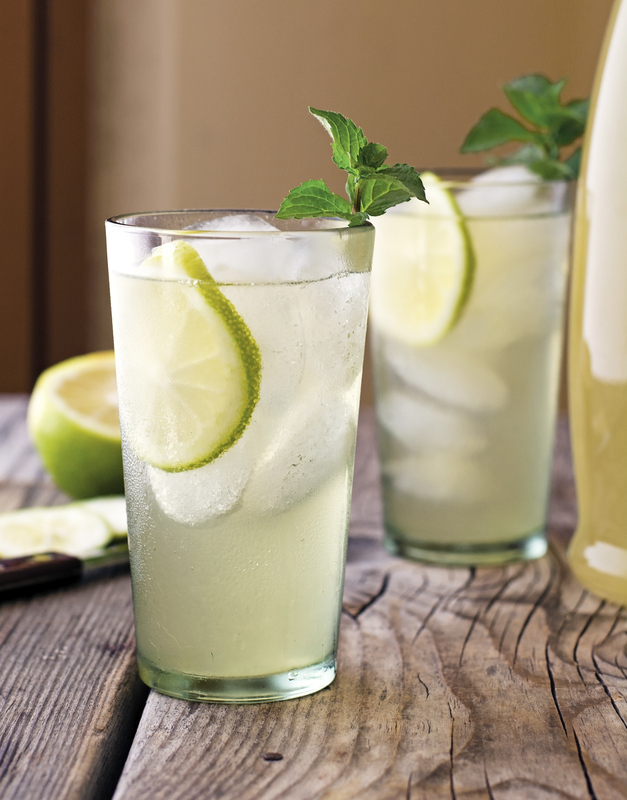 But then I thought about this Green Tea Lemonade — I make all the time — and how delicious and simple to make it is. 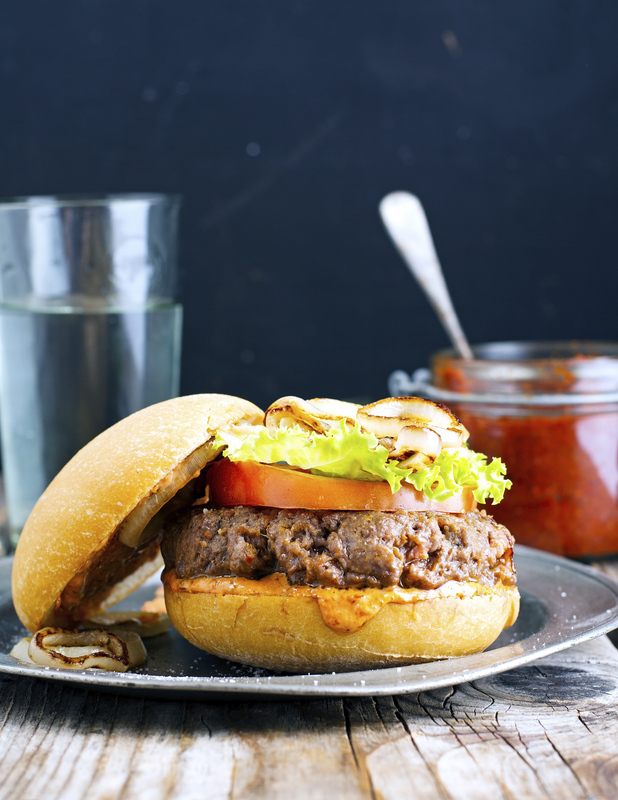 People raved about it and many asked for the recipe. The Fourth is by far one of my favorite holidays of the year. Outdoor parties, food, family, friends, parades, fireworks. It all makes for a perfect day. If you live in the U.S. enjoy this awesome day. Hopefully there will be plenty of sunshine, great food, great people and, why not, a bit of booze too. If you’re living elsewhere, I hope you still have an awesome Tuesday. We’re on the edge of something uh-mazing here. But I think I say that every time I share something with pecans. Something sweet with those crunchy little suckers that make the world seems a better place. 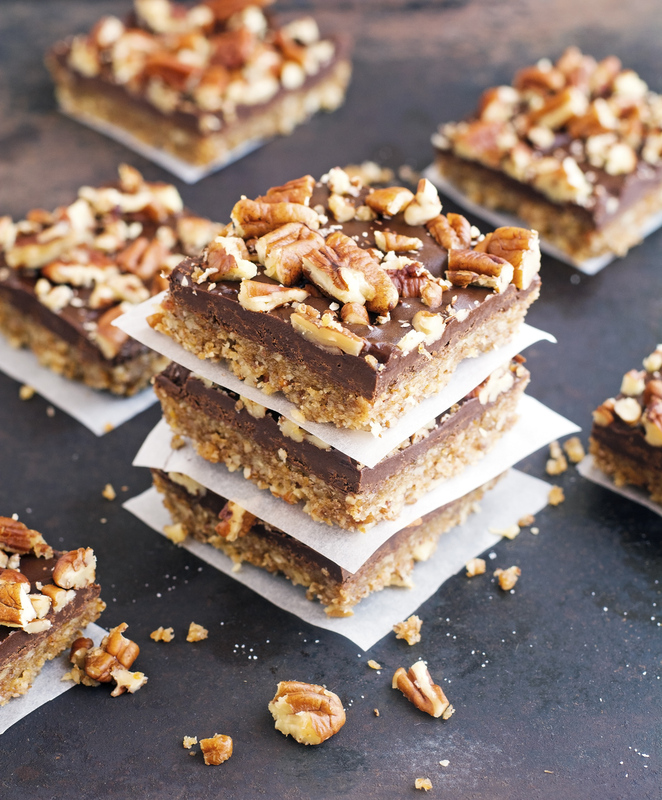 Admittedly my view is bias, yours will be too the moment you’ll taste these Chocolate Pecan Bars. I went ahead and make you a perfect lunch for today. Except I ate it. All. It was too good to resist. So eventually if you could make your own lunch today, I think that it would definitely be best. I’ll tell you what to use, how to cook it, and the reasons why you should cook it. I won’t go as far as cooking it though. Because I will eat it all. 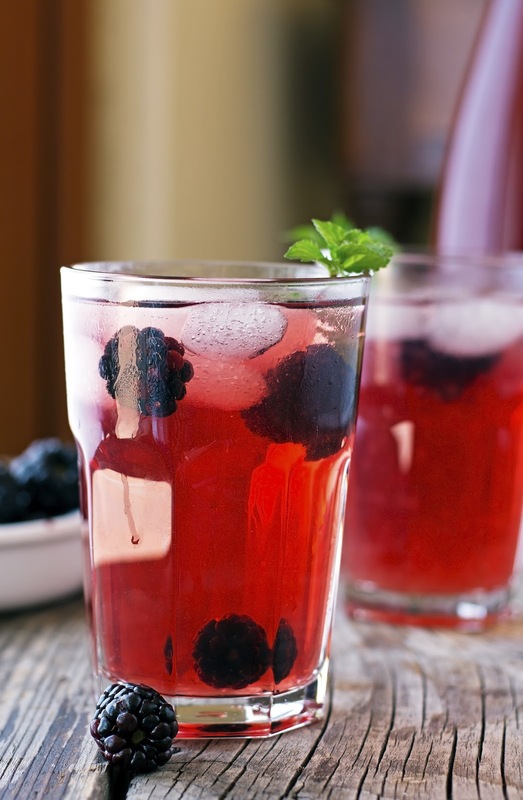 It’s no secret that I share quite a few summer drink recipes around these parts, but every good host knows he needs several top notch refreshing lemonade recipes in his stash — a Blueberry Lemonade and a Peach Mint Lemonade are definitely not enough. 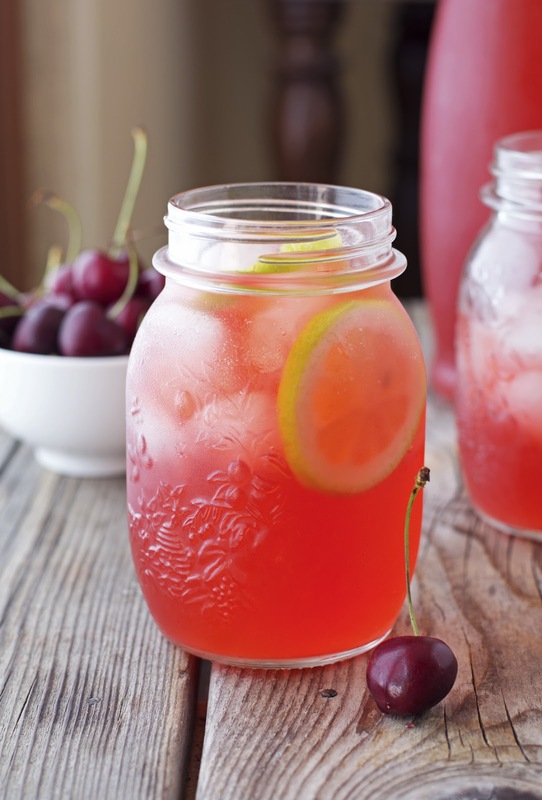 This family friendly Cherry Lemonade is one of my fave for the hot summer days and nights. I love to keep a pitcher made up to enjoy. If family and friends are coming over, I pour it in tall glasses with a couple of lemon slices and lots of ice: Max results, minimum effort! Like the spiritual guru it’s named after, Buddha bowls (sometimes referred to as glory or hippie bowls) are filling dishes that usually include raw or roasted veggies, legumes, healthy grains, sometimes they include toppings such as nuts or seeds, and are usually dressed with a vinaigrette style dressing for added texture and flavor. 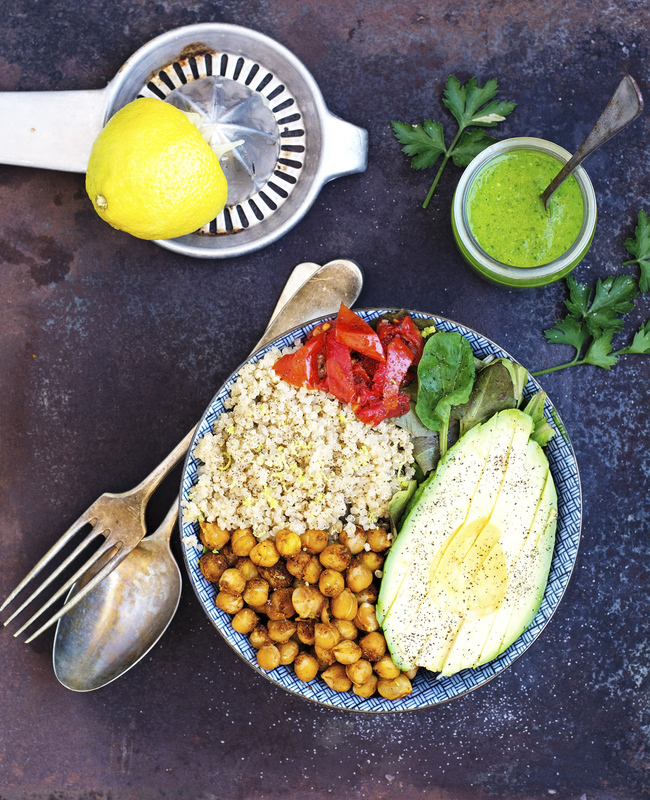 Though Buddha bowls can contain a whole array of ingredients and can be seasoned in any number of ways, the basic formula remains the same. Kabobs or skewers? I call them kabobs but I’ve noticed a lot of people say skewers. 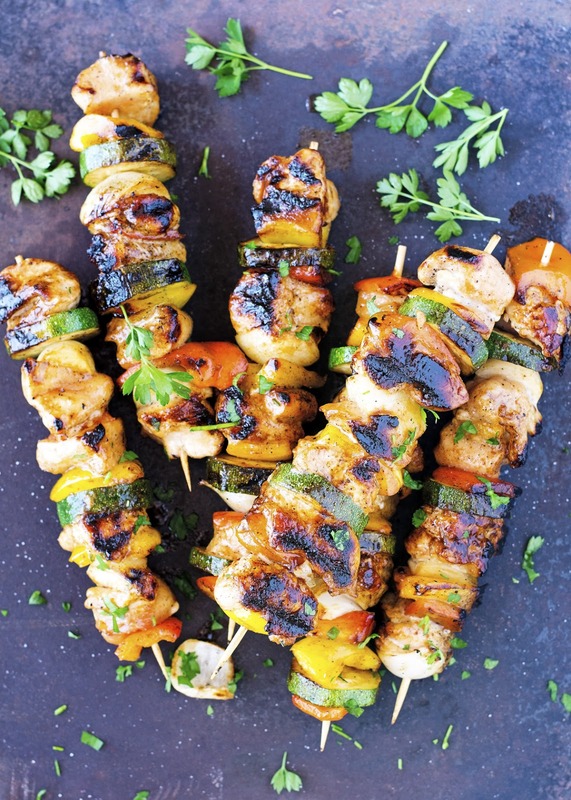 It really doesn’t matter, but these Honey Glazed Chicken and Veggie Kabobs do matter. Actually they’re the only thing that matters to me right now. Chicken, zucchini, bell peppers, and onions marinated in zesty bath of oil, honey, soy sauce, and garlic. Should I stop or do you want me to go on? I love breakfast because it’s a way to sneak in a moment of quiet enjoyment before rushing off into your busy day. 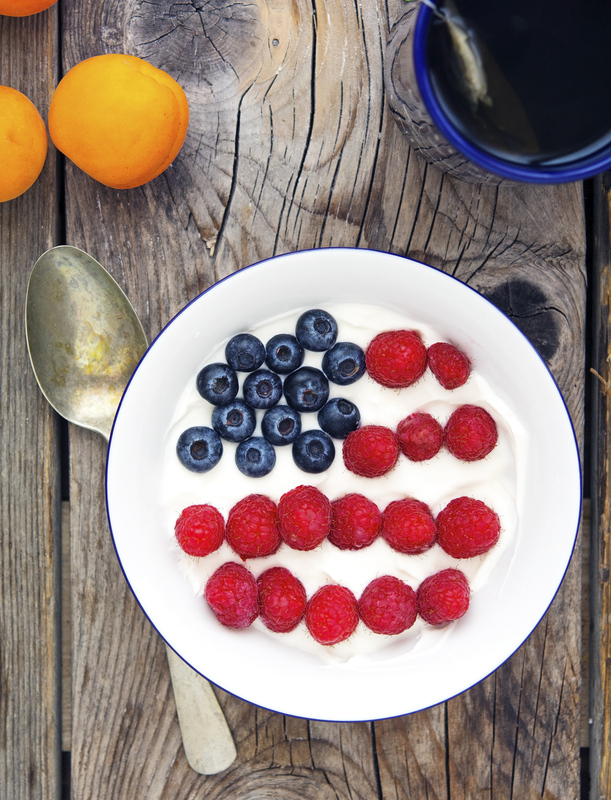 It’s an opportunity to take the time to eat something delicious and nutritious. It’s also — without a shred of doubt — my favorite meal to cook, because there’s nothing fussy about it. While most of the time I’m happy with a chia seed pudding or an energizing smoothie on some mornings I need something more, something more substantial, something like a breakfast sandwich. Let me rephrase that, an AWESOME breakfast sandwich. I can’t blame you. I, just for fun, compared the two and there was no significant difference in color. 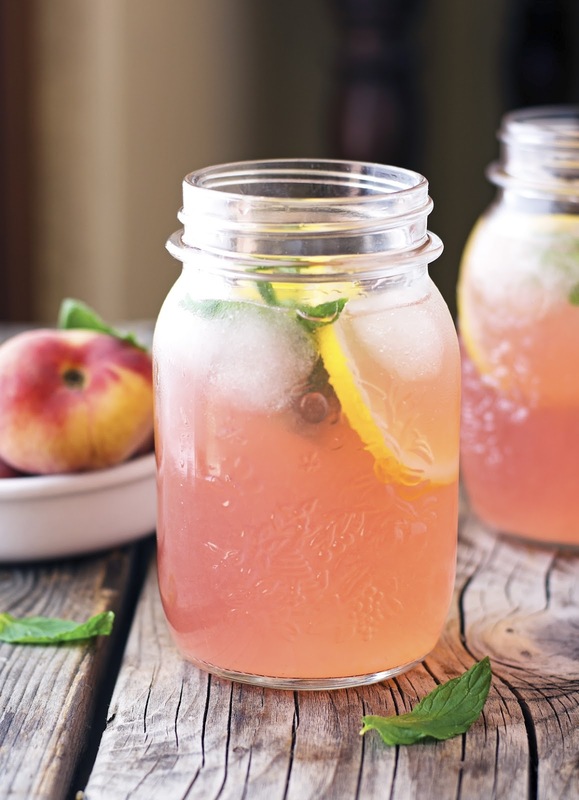 Believe me though, what you see in the pictures is pretty pretty pink homemade Peach Mint Lemonade. So pink it looks like the river in candy kingdom, like it was made by a unicorn or by a princess. You decide. Chocolate. Almond butter. Maple Syrup. Coconut oil. Crispy Rice Cereal. Surely, you can’t hold it against me. Who could resist? These are some of the most awesome words in the dessert glossary. 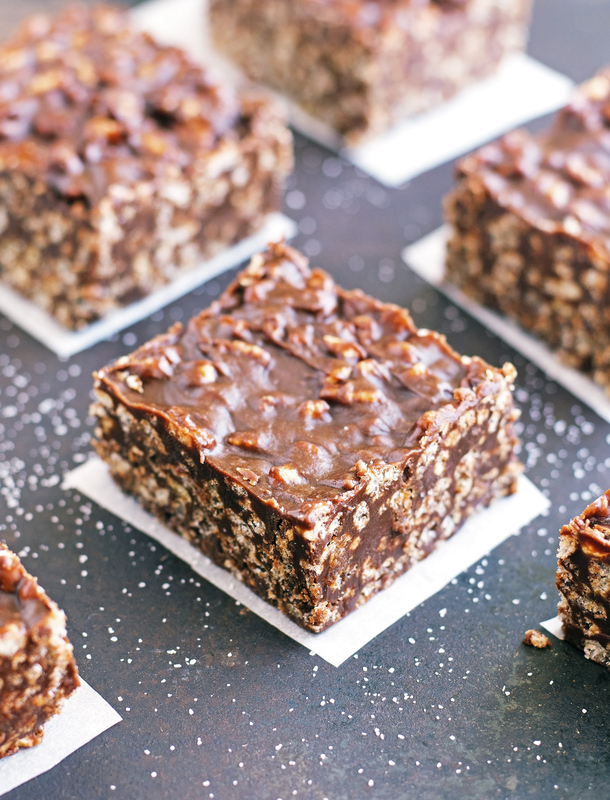 And if you think that my fave breakfast when I was a kiddo, was a huge bowl of Rice Krispies sprinkled with two tablespoons of chocolate Nesquik, you can pretty put together the story of how I ended up with these bars. Look at them! Honestly, who can resist so much awesomeness? A thing I have learned over the last 5 years here (has it been that long already?) is that people have very strong opinions on eggplant. Some find it to the be awesome, especially when it’s spicy or paired with tomato sauce, others just don’t care about it, and no matter what you do with it, they’re never going to be converted. Today’s recipe is brought to you by a couple of things: simplicity and an insatiable snack craving. I’ve been so busy lately, I’ve found myself eating fewer meals, and nibbling throughout the day. Almonds though, of those suckers I’m pretty sure. 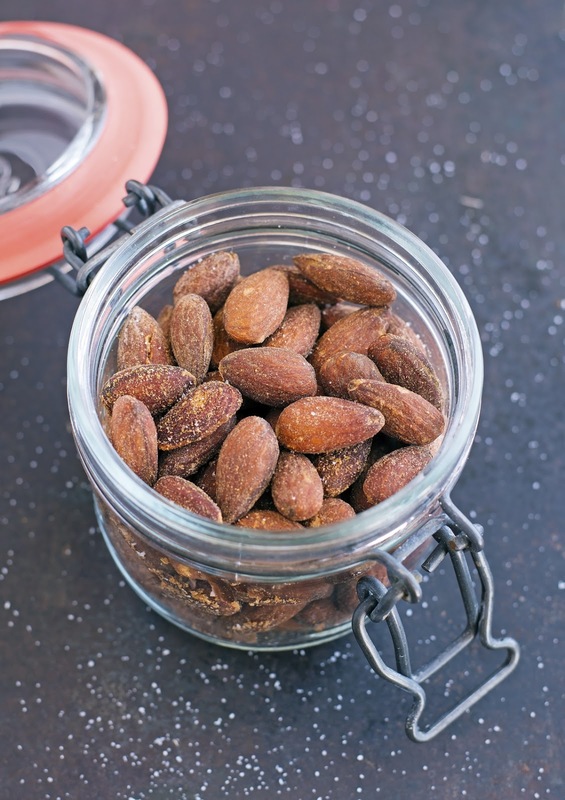 They’re an excellent source of protein, good fat, and fiber, a constant staple in my pantry, and are one of my favorite snacks. The shredded chicken is fall-apart tender and the sweet tangy flavor of the sauce bursted in the mouth. Not to mention this is arguably one of the easiest BBQ chicken I’ve ever made. You know those times when you don’t have time to stand over the stove and want to cook something delicious with the minimum of fuss? 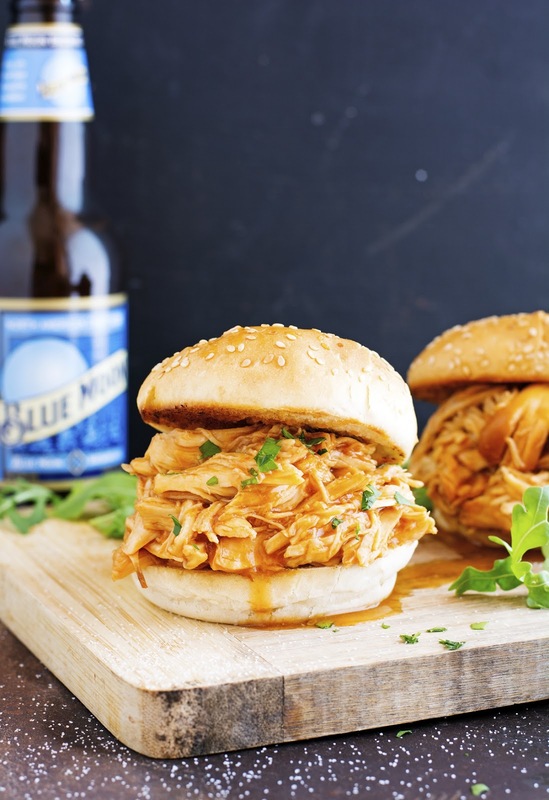 this Crock-Pot Chicken Barbecue is going to save your life. 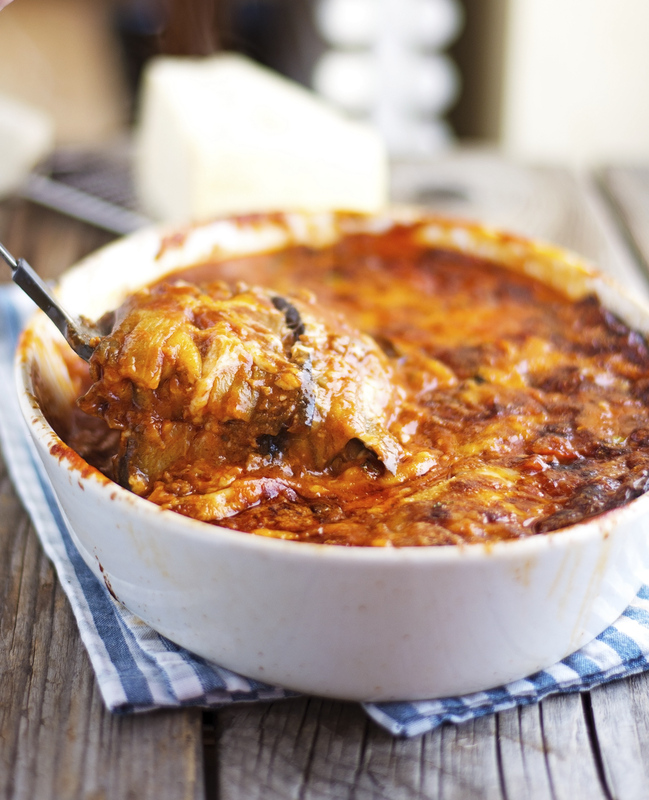 Throw everything in the slow cooker without any special prep and let it work its magic.